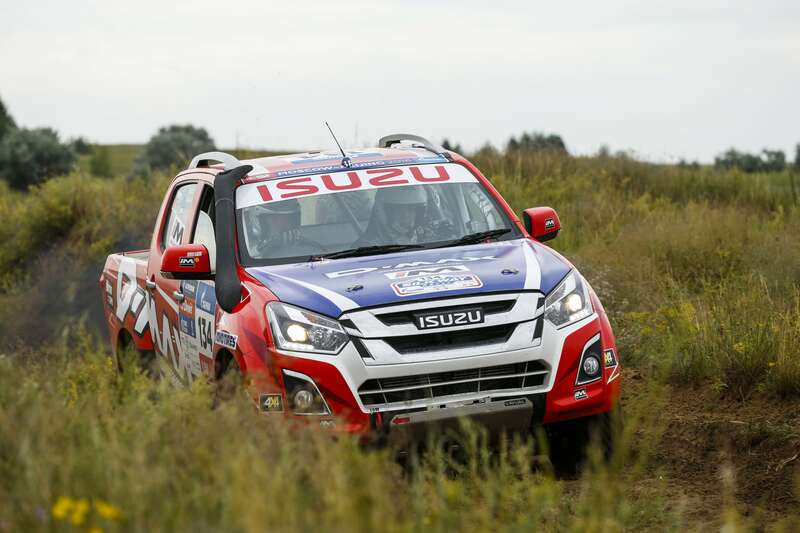 The ISUZU rally team will soon depart for Moscow to contest the Silk Way Rally, which will put their new ISUZU D-MAX to the ultimate test over 10,000 kilometres and 15 stages of tough terrain spanning from Russia to China on July 8 to 24. It is the latest challenge for Western Australian driver Adrian Di Lallo and co-driver Harry Suzuki (NSW), who have taken on some of the world’s toughest off-road rallies including the Dakar and the China Grand Rally. In car number 134, the ISUZU D-MAX will compete for top honours in the ‘T2’ Production Class. Unlike the ‘T1’ class where vehicles are heavily modified and often have little in common with their daily driven counterparts, the ‘T2’ class permits only safety and basic modifications – making ISUZU competition vehicle similar to the ones available to purchase at a dealership. Despite its minimum modifications, Di Lallo is confident the brand new 120kw truck tough ISUZU D-MAX is up to the task. “I’m really looking forward to the challenge of the Silk Way Rally,” said Di Lallo. “I am expecting the terrain, much of it unchartered, to be tough. I’ve never been to Russia before, so I’m excited about the ceremonial start in Moscow at the Red Square. “I’m expecting that some stages in Russia to be quite fast forest rally roads, in Kazakhstan desert and mountainous ranges, and I’m expecting major sand dunes in the north of China. “Our D-MAX is like the ones you can buy from the showroom floor. However, it has been modified for safety in accordance with the rally regulations – beefed up suspension, regulation brakes, and the addition of a safety roll cage, harness and seats. “At this stage I’ve done all the physical training I can do. I’ve concentrated on my fitness and my core strength for endurance. Now it is about the mental preparation, going into the event feeling relaxed and focused. “It’s a marathon rally raid event and we’re going to be treat it as such, pushing while being mindful that we need to preserve the car. 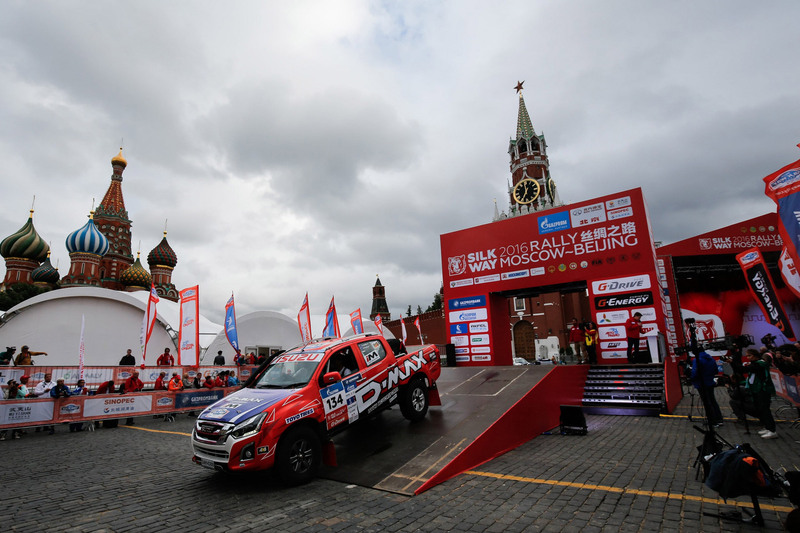 Di Lallo and Suzuki will join approximately 130 other vehicles for the sixth edition of the rally raid event, which will depart Moscow’s iconic Red Square on the 8 July, loosely following the historic Silk Road trade route linking Russia, Kazakhstan and China. Competitors will spend 15 days of racing through Russian Kazakhs and Chinese landscapes with stages taking them through forgotten towns and over some unhospitable terrain such as deserts, mountain passes and vast steppes. The lucky few to overcome the challenges in extreme conditions will arrive to a hero’s welcome at the Chinese capital in Beijing on the 24 July, past the Great Wall and Tiananmen Square. The Silk Way Rally has become a major event in the International Cross-Country Rally calendar. The rally is organised by Vladimir Chagrin, a legend of the Dakar Rally, winning it seven times and holding an impressive record of 63 Dakar leg victories. 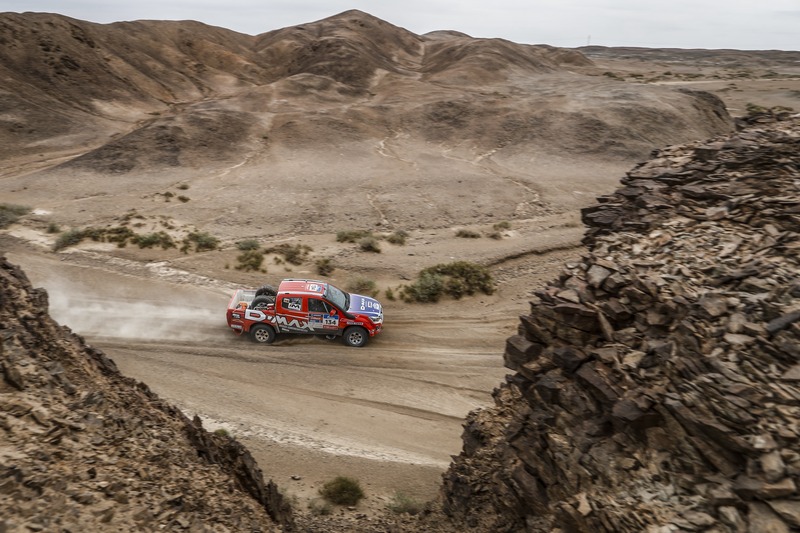 The adventure and challenge of the Silk Way rally has also attracted an impressive array of racing ‘celebrities’, including multiple Dakar winners Stėphane “Mr Dakar” Peterhansel (12 times) and Cyril Despres (5 times), and seven-time World Rally Champion Sebastien Loeb. Constructors such as Peugeot, Toyota and Ford and Europe’s best privateer teams will battle for rally-raid glory in the car category. Kamaz-Master will be the target of all the other big-rig crew, led most notably by Renault Trucks in its quest for yet another triumph in the class of the behemoths. The Silk Way Rally starts in Moscow on 8 July and finishes in Beijing on 24 July. Competitors will travel 10,000km including 4,200km of special stages through three countries - Russia, Kazakhstan, China, over 15 days. 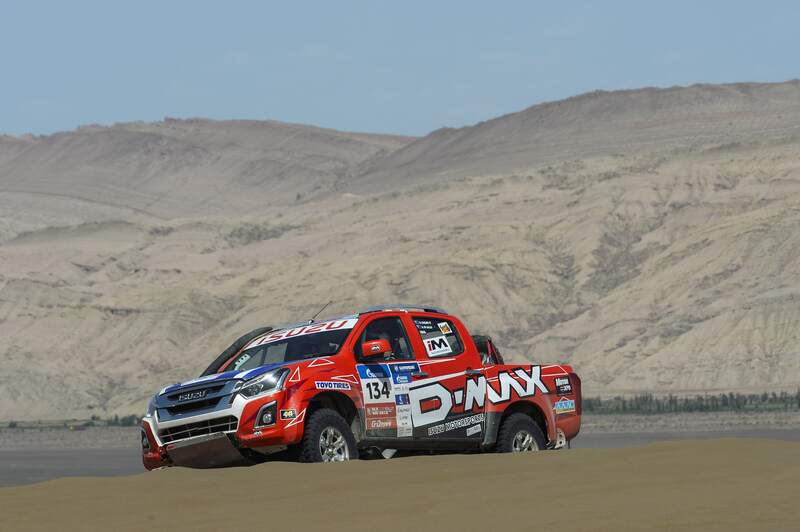 The ISUZU rally team is off to a promising start in the Silk Way Rally, with Adrian Di Lallo and Harry Suzuki successfully putting their ISUZU D-MAX through its paces during the Prologue to finish fifth in the T2 Production Dieselclass. 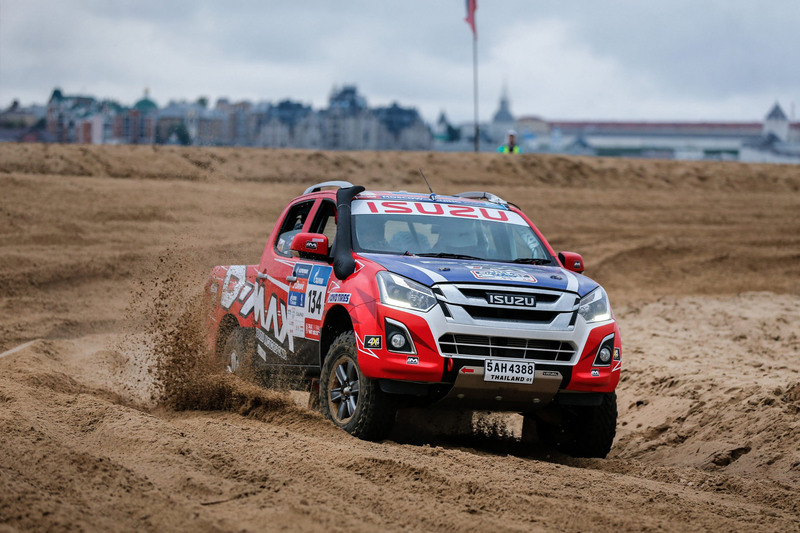 After the Ceremonial Start held in Russia’s iconic Red Square, the team’s brand new Turbo Diesel ISUZU D-Max was trucked to the Prologue’s Special Stage in Kazan, Russia – almost 14 hours away from their starting destination in Moscow. Held in an arena, the Prologue was a short 2km blast along sand tracks, which saw competitors needing to be mindful of ruts and jumps. The results determined the starting order for Leg 2, with the D-MAX posting a time that would see them be the 69th car off the start line the next morning. Reaching the start line felt like an achievement in itself for the team, due to themajor logistical dramas they experienced earlier in the week when their service truck’s container missed its transshipment, ending up in Italy instead of Russia. “Our service truck and gear left Gioia Tauro Italy by truck last Saturday. It then crossed through Slovenia, Poland, Lithuania, and Latvia where it was held up for 11 hours. When it reached the border to Russia it was held a further twelve hours until a special phone call was made to the Kremlin. It then reached us at Luzniki Stadium in Moscow without a moment to spare! Team Peugeot Total driver and Dakar legend Stephane Peterhansel posted the fastest Prologue stage time, and will start first on Leg 2, which will take competitors on a 626.66km journey to Ufa, Russia. Competitors have been warned to expect the terrain on Leg 2to be slippery after recent rains, but the ISUZU rally team are confident the smooth power delivery of the D-MAX’s turbo diesel engine will ensure they stay on track. Amongst the colourful red livery on ISUZU D-MAX the team is sporting ‘Morgan’s Forever’ stickers which is to keep the memory alive of a young friend of the team who passed away suddenly. The competitive element of the Silk Way Rally’s Leg 2 was cancelled yesterday due to continuing inclement weather, which prevented organisers from being able to put the safety helicopter in the air. 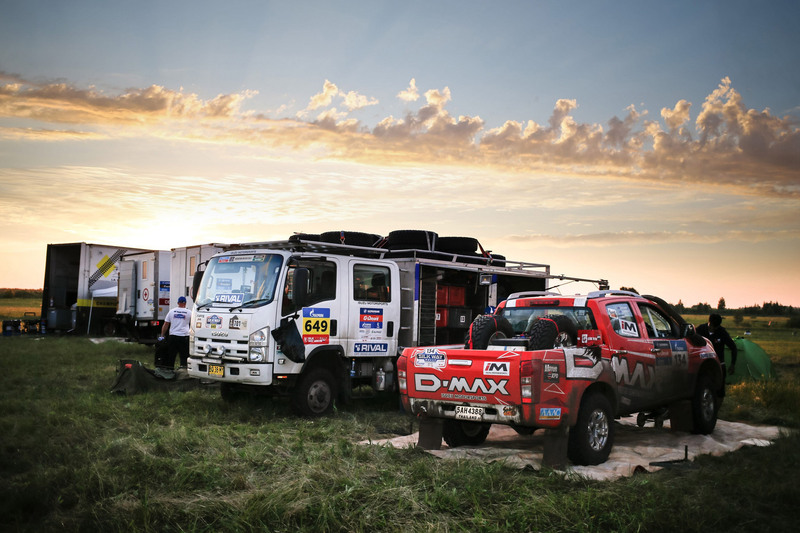 The ISUZU rally team instead transported their D-MAX on the 557km journey from Kazan to Ufa, where they experienced a warm welcome from the residents of Naberezhyne Chelny - home of Kamaz Trucks, who had formed a crowd to meet the competitors. Tomorrow the team will leave the vehicle manufacturing metropolis of Ufa and make the 815km journey to cross into Kazhakastan, where they will spend the night at a bivouac set-up in Kostanay. The 271km gravel terrain on Leg 3’s competitive stage is said to be a challenging route for navigators. 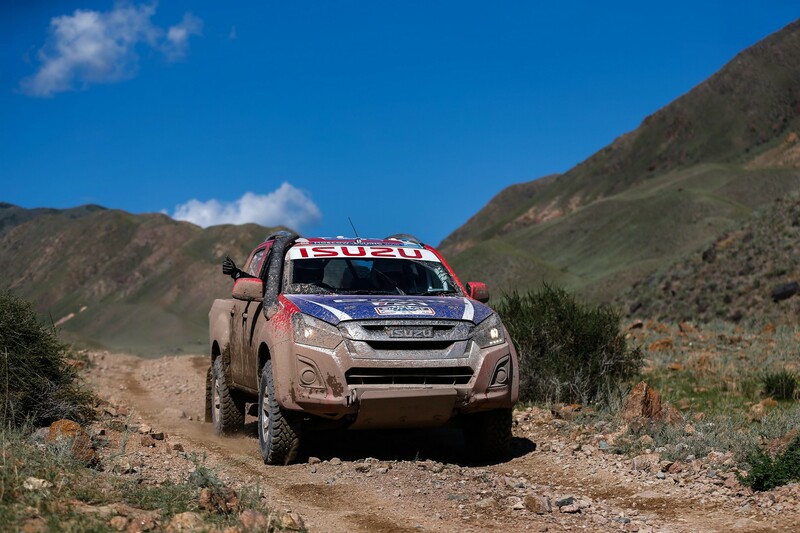 ISUZU rally team have broken through the dust trail on Leg 3 of the Silk Way Rally, and have quickly climbed the leaderboard to be leading the T2 Production Diesel class and sitting second overall in the T2 Production category. This great result for the team did not come easy, with Adrian Di Lallo and Harry Suzuki having to guide the D-MAX through the 200km competitive course mostly blind due to the persistent dust. “It was a tough day,” said Di Lallo. “Due to being cautious at the Prologue, we spent most of the day stuck in the dust after starting well back in the field. “We managed to pass several cars but because of the poor visibility we found it difficult to get a clean run, and as a result emerged from the stage a little battered after an off-road excursion. The T2 Production category only permits light modifications to the vehicles, which sees the team’s 2016 ISUZU D-MAX very similar to the version available for sale to the public. The team started the day in 63rd place overall from 102 starters, and crossed the finish line in 36th position. There was a leadership change in the overall standings, with Stephane Peterhansel and Jean-Paul Cottret suffering two punctures which saw them drop to 8th position overall. It was former Dakar Moto rider Cyril Depres and co-driver David Casterawho set the fastest stage time, which saw them take the rally’s lead. Organisers warn crews that today’s Leg 4’s 345km competitive course features ditches and ruts, ensuring the team’s co-drivers will be kept busy. The total distance of the Leg equals just over 855kms, and will take competitors further into Kazakhstan, with the day’s liaison concluding in the capital city of Astana. Liaison, 632kms; stage 223km (reduced). The 855km journey to Kazakhistan’s capital city Kostanay was not an easy one for any of the teams in the Silk Way Rally - heavy rains turned the dirt tracks to mud, and an impassable bridge crossing caused officials to shorten the stage. ISUZU rally team slipped down four spots in the overall rankings to finish the day in 40th position, which was unsurprising given what a difficult day it was for all teams. The previous day’s overall leaders Cyril Depres and David Castera also slipped down four spots after they hit a block of cement in tall grass, which forced them to slow down. StephanePeterhansel was grateful to be further down in the pack due to the cars in front of him clearing the way - he set the fastest time and returned to the top of the leaderboard. In the T2 Production category, the D-MAX just missed out on a Top 3 placing. They now sit 13min 45sec behind the category’s front runners Aleksandr Terentiev and co-driver Alexey Berkut, who experienced their second stage win of the rally. The ISUZU rally team was uncontactable for comment on the Leg, but they are no doubt focused on today’s marathon Leg 5, which at 568kms is the longest competitive stage of the event. Leg 5 takes competitors from Astana to Balkhash near the border of Kyrgyzstan, and past one of Asia’s largest lakes, Lake Balkhash. It is also expected to be another stage which competitors will battle to find grip amongst the mud and water as they navigate their way through water-crossings. The fifth day of the Silk Way Rally was a picturesque one, as competitors passed by one of Asia’s biggest lakes – Lake Balkhash, but despite the stunning scenery the marathon stage of 568km was gruelling with mud and hidden rocks. The trials of the course took its toll on many competitors and their vehicles, with 12 less cars crossing the stage’s finishing line than the previous day. The ISUZU rally team (ISUZU D-MAX; Car 134) crossed the finish line in 49th place overall, but the stage didn’t go fully to plan for Di Lallo and Suzuki. “Unfortunately my concentration lapsed at about 380 kilometres in, and we slipped into a very deep, muddy truck trench. “We thought it would be a quick fix to free ourselves from being bogged, but we then experienced problems with our jack which took an hour to fix. Luckily, after we fixed the jack a friendly truck competitor helped pull us out of the mud. “Once we were back on track, we then found ourselves stuck in the dust of the competitors we had worked to pass before, which was frustrating. “Our spirits are still high though - we are in this for the long game! T2 will be a race to the finish and there is still a long way to go. We won’t catch up all the lost time in one day, but we’ll continue to chip away at it in the remaining stages. 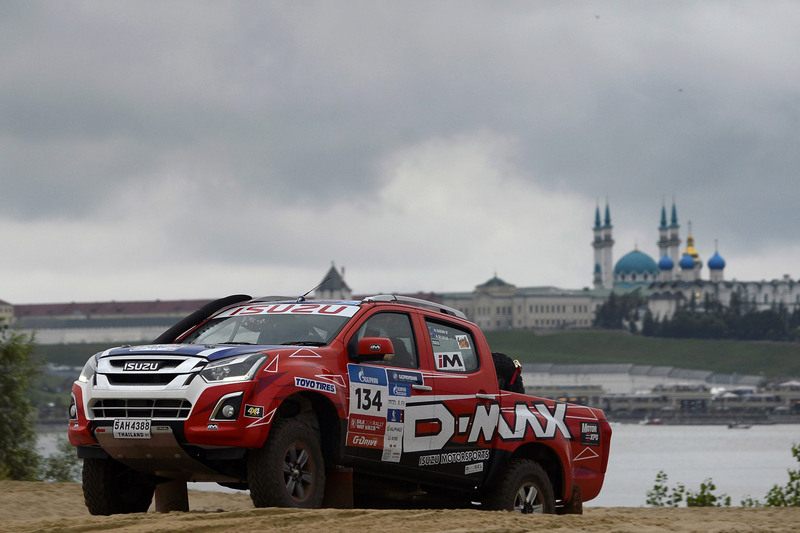 The ISUZU D-MAX currently sits in 8th position out of the 12 T2 competitors who remain. The team will have 2 hours and 18 minutes to make-up if they want to catch category leader Akira Miura and co-driver Laurent Lichtleuchter. One of the cars not being able to finish the stage was the Peugeot of StephanePeterhansel and Jean-Paul Coffret who sustained major front-end damage when the vehicle rolled multiple times at 416 kilometres into stage. Fortunately, no one was injured and the team are working to repair the vehicle for Leg 6. Cyril Depres and David Castera remain as the outright leaders, and will start Leg 6 with a lead of almost 15 minutes over Sebastien Loeb and Daniel Elena. Leg 6 will be another marathon, comprising of two timed sectors of 111km and 224km. This stage will see competitors leave the mud and head for the sand, with sandy tracks and small dunes. The goal will be to reach Almaty, which is Kazakhstan’s largest city and set in the foothills of the Trans-IlliAlatau Mountains, it also marks the half way point in the rally. 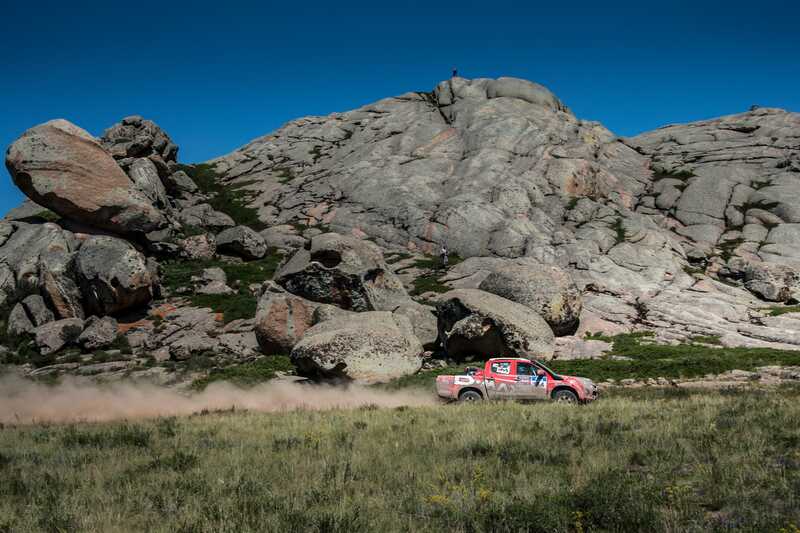 Leg 6 saw Silk Way Rally competitors leave behind the muddy terrain of the Seven Rivers Lake area and head for Almaty, with the reward of a well-earned day’s rest once they crossed the finish line – but first they had to push through 789 kilometres of sandy dunesdotted with jaggered rocks. 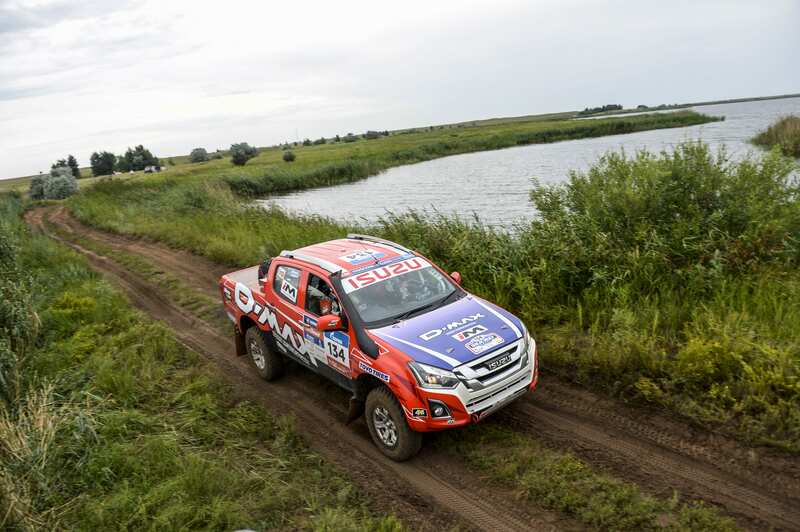 The ISUZU rally team of Adrian Di Lallo and Harry Suzuki (Car 134; ISUZU D-MAX) were focused on reclaiming some of the time lost from the previous day, and by finishing the stage with the second fastest time in the T2 Production category they were successful in their goal. “We had a good clean run and the car ran faultlessly in extremely harsh conditions,” said Di Lallo. “The track was rough, and mostly comprised of heavy sand skirting the salt pans. The second stage of the leg was cancelled due to a storm warning which would prevent the safety helicopter being able to take to the air. 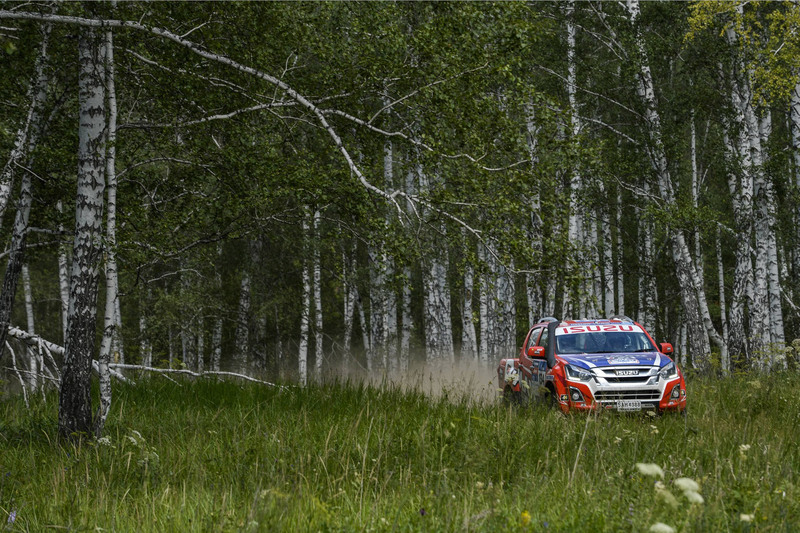 Aleksandr Terentiev and co-driver Alexy Bekrut continue to lead the T2 category, almost two hours in front of the ISUZU D-MAX. It was Americans Damen Scot Jefferies and Max Eddy Jnr in their homemade Jefferies Buggy who set the fastest time on the reduced stage. They kept a minute and a half ahead of Stephane Peterhansel and Jean-Paul Cottret, who also recovered from a disastrous previous Leg. Cyril Depres and David Castera continue to command the rally as outright leaders, with a gap of 8 minutes between themselves and the duo of Sebastien Loeb and Daniel Elena. Today is a rest day for competitors – although it is a rest day only in name, as many competitors including the ISUZU rally team will be working hard to prepare their vehicles for the remaining nine legs and almost 6,000 kms. Day 7 of the Silk Way Rally was a rest day for competitors, but only in name as they worked hard on their vehicles in preparation for tackling the 6,000kms of harsh mountainous and desert terrain that stands in between them and the finish line in Beijing. 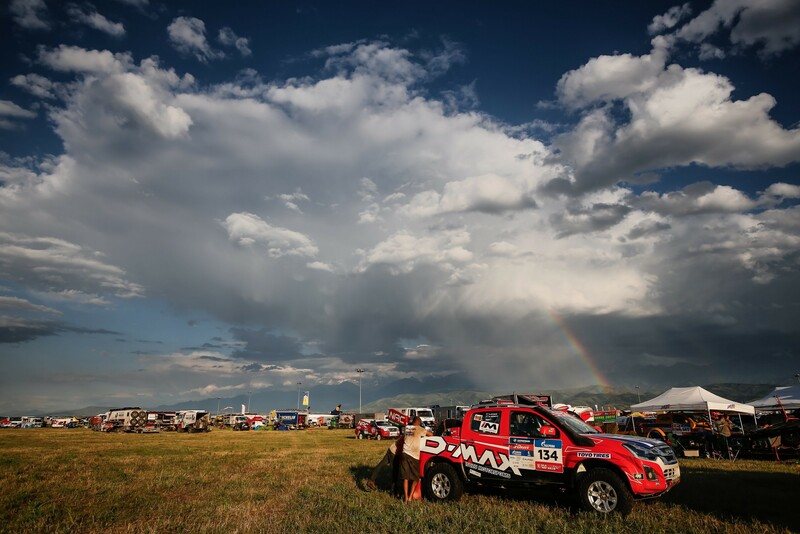 After completing the previous day’s shortened stage, the team arrived at the bivouac set-up in Almaty Kazakhstan, and set about thoroughly checking over and cleaning the 2016 diesel ISUZU DMAX in the shadow stunning Tian Mountain range. Team driver Adrian Di Lallo and co-driver Harry Suzuki also used the rest day to reflect on how far they had come, and to mentally prepare for the remaining nine legs. “I enjoy the challenge of competing in the T2 production category, especially in a car that isn’t a traditional-style rally raid vehicle such as the ISUZU DMAX,” said driver Adrian Di Lallo. “The DMAX is what we call in Australia a workhorse, it is designed for a utilitarian purpose and not the type of vehicle people would normally associate as one you would take on a race like the Silk Way Rally – let alone be able to achieve competitive stage times with! The next leg of the rally will see the team compete in a short 76.86km stage close to the Tian Mountains, before saying goodbye to Kazakhstan and crossing into China. Going into the final half of the rally, the ISUZU D-MAX (Car No.134) currently sits in 46th place outright. In the T2 Production category for vehicles that are only lightly modified, the team occupies 7th place out of the remaining 14 vehicles in the category, with a two hour deficit to the category leader Aleksandr Terentiev and co-driver Alexey Berkut. 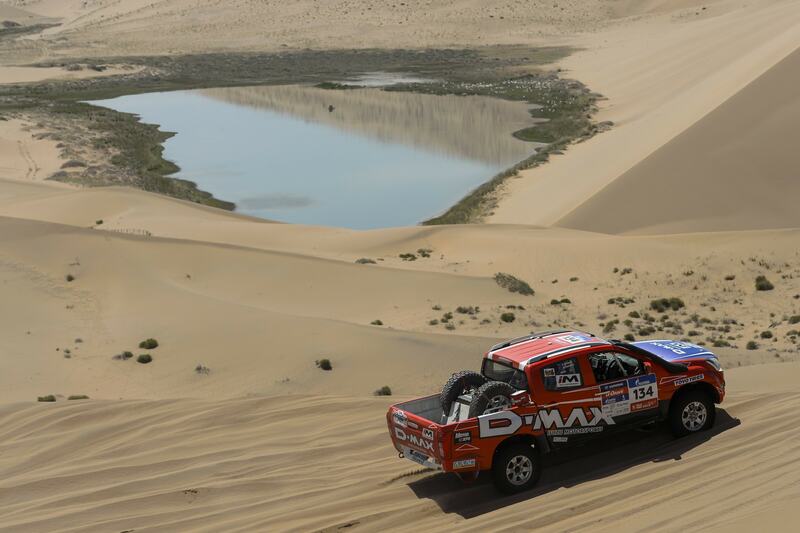 “Even though we think we might be at a slight disadvantage when it comes time to take on the incredibly tough dunes of China, I am very confident that the DMAX has what it takes to reach the finish of this amazing event,” said Di Lallo. Silk Way Rally Ambassador and Sporting Consultant Luc Alphandsays that competitors will need to ensure they keep their focus throughout the remaining legs in order to be successful. “The first week of the race has already been very interesting,” said Alphand. “The particularly demanding navigation in Russia and Kazakhstan played an important role. “As expected, the Peugeot DKR2008s dominated the early part of the rally, but the MINI ALL4 Racing entries are still in contention. “Stage 5 between Astana and Balkhash, the longest of the rally claimed its first major victim, pre-rally favourite, Stéphane Peterhansel. With two cars at the top of the order, Peugeot cannot afford another error. By the time competitors cross the finish line in Beijing China on July 24, they will have completed 10,000kms and crossed three countries. Silk Way Rally competitors said goodbye to Kazakhstan with a short yet incredibly challenging stage in and around Tian Mountain range, before crossing the border into China. 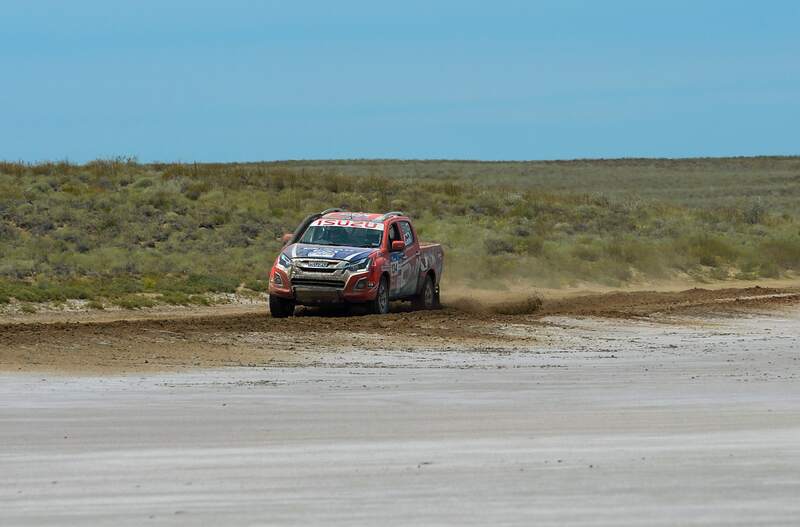 The stage was held on high-mountainous plains, and saw the production-spec ISUZU D-MAX (Car 134) subjected to rock ridden, extremely testing terrain, which team driver Adrian Di Lallo said the vehicle handled without incident. “Today’s special called for much discretion, and definitely wasn’t a stage to be racing against the clock,” said Di Lallo. “The stage wound its way up 2,000 metres above sea-level, over and through a mountain range, following along what could be best describing as a mountain goat track. “The track was rough and heavily rutted with huge drop offs, and was better suited to a Kamaz truck than a leaf spring ute. Di Lallo’s and co-driver Harry Suzuki’s steady, cautious approach saw the team finish the day two positions ahead of their Leg 6 results in the outright standings – with Car 134 of ISUZU D-MAX now occupying position 44. Cyril Despres and co-driver David Castera are still at the top of the outright leader board. However, with less than half an hour separating the Top 5 the Peugeot team will have no room for error. IIn the T2 Production category, it was the Kazakh duo of Denis Berezovsky and Roman Elagin who set the fastest stage time. Di Lallo and Suzuki crossed the finish line in sixth place, 16 minutes after Berezovsky and Elagin. Today will be a long day behind the wheel for Silk Way Rally competitors, with a 648.42km liaison and 256.93km special stage. 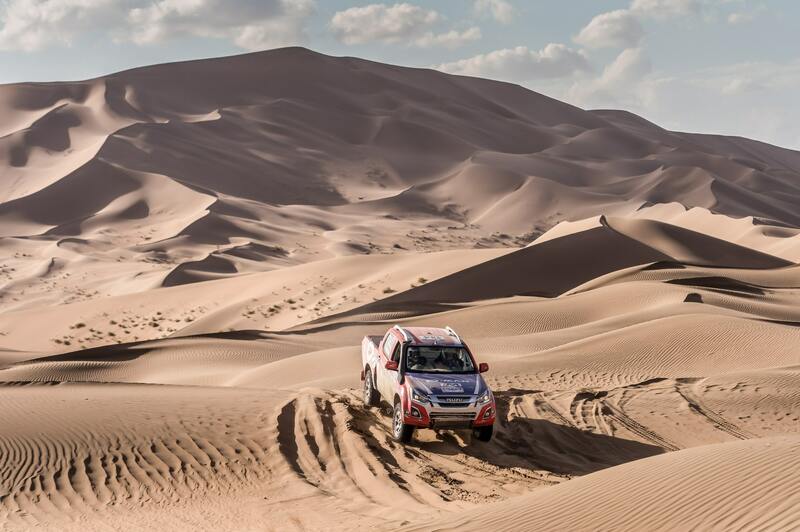 The rally will go through the Junggar Basin, an area known for its dryness and extreme temperatures, to then follow a fast winding track on a fault line, before competitors take to the sand in a sprint to the bivouac in Urumqi. 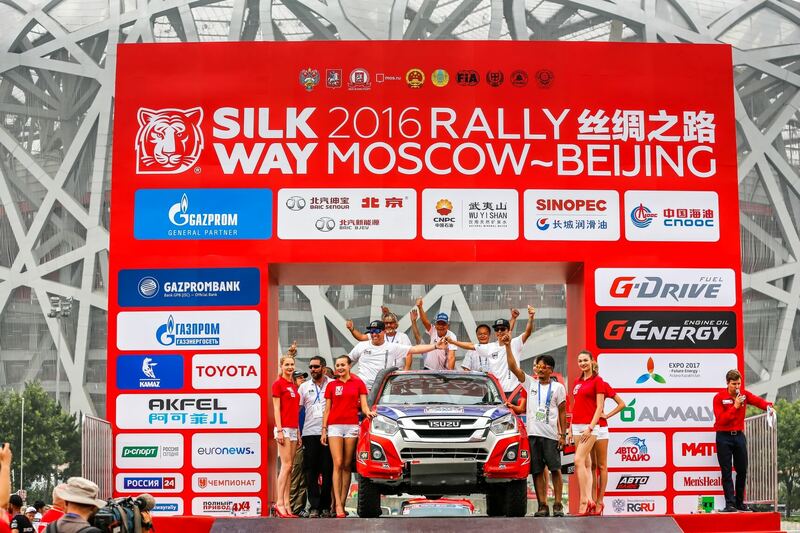 The first special stage held in China was an extremely tough one for Silk Way Rally competitors, but the ISUZU rally team of Adrian Di Lallo and co-driver Harry Suzuki managed to get their production-spec D-MAX through the 256km special stage unscathed. Leg 8 also featured the longest day’s travel of the event, with competitors having travelled 905km by the time they reached the bivouac in Urumqi. The team applied a cautious approach to the stage which paid off, seeing them finish the stage third in the T2 Production category, 1hr and 20min behind category winners Denis Berezovskiy and Ignat Falkov. 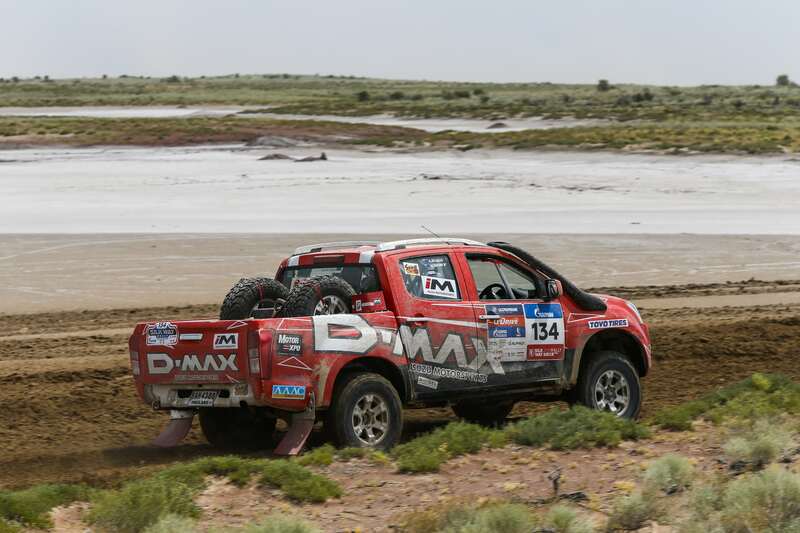 “It was a very tough stage which claimed many competitors but the DMAX didn’t skip a beat!” said Di Lallo. “This was great for our guys as many crews worked through the night and were continuing working on their cars when we left the bivouac this morning. “The stage was reminiscent of a typical Dakar stage with everything! It started in heavily rutted deep sand tracks and transitioned into fast tracks, before moving into steep dunes for the mid-section, and finishing off with a nice helping of feshfesh. In the outright standings, the ISUZU rally team now has moved into 40th place. The stage was won by Yazeed Al Rahji and Timo Gottschalk in the MINI ALL4 Racing. Al Rahji was surprised by the win, saying he thought the stage was better suited to buggies. The outright leadership remains unchanged, with Cyril Depres and co-driver Jean-Paul Cottret still in first place, and Sebastien Loeb and David Elena still in second, 6mins behind. The next leg sees teams journey from Urumqi to Hami, through the Turfan Basin which is known to get to 60 degrees Celsius. The 384km stage is comprised of all desert terrain, with an impressive wall of dunes to conquer from the start line. Silk Way Rally competitors could be forgiven for thinking they had entered hell on Leg 9, with competitors navigating their way through extremely difficult desert terrain in searing 55° Celsius heat. Adrian Di Lallo and Harry Suzuki of ISUZU rally team (car 134) continued to apply a cautious strategy, and as a result they were able to finish the extreme 335km special stage which saw the retirement of at least five teams. “The stage started directly at the foot of a gnarly dune that extended for approximately 30kms,” said Di Lallo. “Although we had to throw the D-MAX in hard due to the body clearance and overhang, it handled the steep dunes with a relative ease that put much fancier, purpose built race cars to shame. “After the dune crossing was complete, the remainder of the 290km special was on what I can only describe as the track from hell! It was so rutted that we struggled to get past third gear for the last half of the stage. “The stage took many casualties – there were at least two rollovers that we saw. Although Di Lallo and Suzuki’s approach may have cost them time, it certainly didn’t cost them position in the outright standings, with the team jumping up nine positions after the stage to finish the day in 31st. Cyril Depres and David Castera again continue their almost flawless run, pushing their outright lead to 12mins 17secs. Despite having some difficulty on the stage, after becoming bogged in the sand for a short time, Sebastien Loeb and David Elena continue to occupy second-place. The T2 Production category standings remain unchanged, with the ISUZU D-MAX still occupying fourth place – 4hrs 18mins behind current category leaders Akira Miura and co-driver Laurent Lichtleuchter. Competitors need to brace themselves for another hard long day, with Leg 10 offering no reprieve from the extreme terrain and harsh heat. The 340km special stage will be held at a peak altitude of 2,000 metres above sea level and features dirt tracks, wadi crossings and canyons. 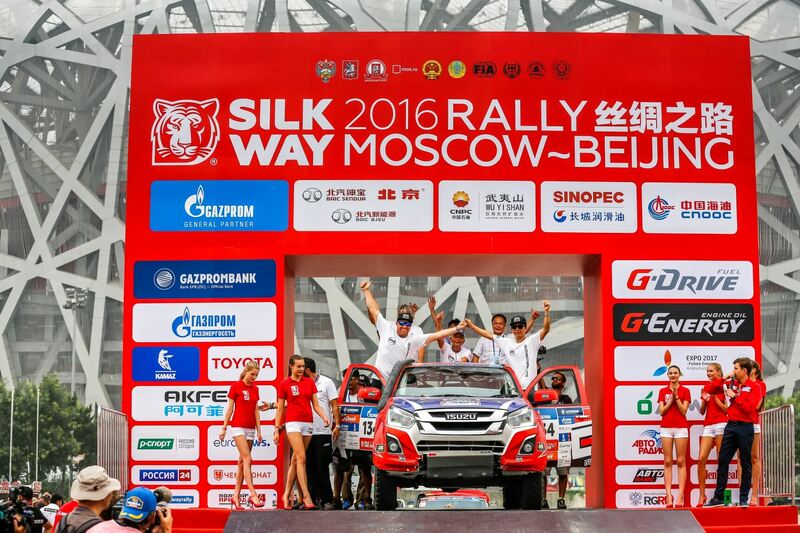 The ISUZU rally team has conquered another incredibly tough stage on the Silk Way Rally, which challenged both the physical stamina of the team and the durability of their production-spec DMAX. Once again competitors felt the full-force of the desert heat – making it difficult to retain focus on the tricky 340km special stage in the Hami Basin. Despite all the challenges thrown at them on Leg 10, Adrian Di Lallo and Harry Suzuki completed the stage third fastest in the T2 Production class. “We had a reasonably trouble free run on the 340km special,” said Di Lallo. “The stage started off with nice fast flowing rally type roads, which gave us a false sense of security that it was going to be an easy day – oh how wrong we were! “Those nice easy roads soon transitioned into heavily rutted tracks, with many gutters and unscripted cautions. The powerline track that came after was much of the same – full of gutters and ‘whoops’ moments. “We were caught out with some tricky navigation in heavy breakaway country, along with several other competitors – but it didn’t take long before we realised our error. The team finished the stage just under 40 minutes behind T2 stage time leaders Akira Miura and co-driver Laurent Lichtleuchter, who are also leading the T2 category outright. Stephane Peterhansel and co-driver Jean-Paul Cottret have bounced back after a series of mishaps to claim the stage win, with Sebastien Loeb and Daniel Elena only 1min 15sec behind. The outright standings remain unchanged with the 2008 Peugeot Dakar vehicles still on top of the leaderboard - Cyril Despres and David Castera in first, and Sebastien Loeb and Daniel Elena almost 2 minutes behind in second. Today’s 330km Special Stage 11 has been cancelled due to a sandstorm preventing the event’s safety aircraft from being able to fly. The team will join other Silk Way Rally competitors travelling in convoy from Dunhuang to Jiayuguan. With the cancellation of today’s stage, there are just four stages remaining until Silk Way Rally competitors reach the final finish in Beijing, China on July 24. 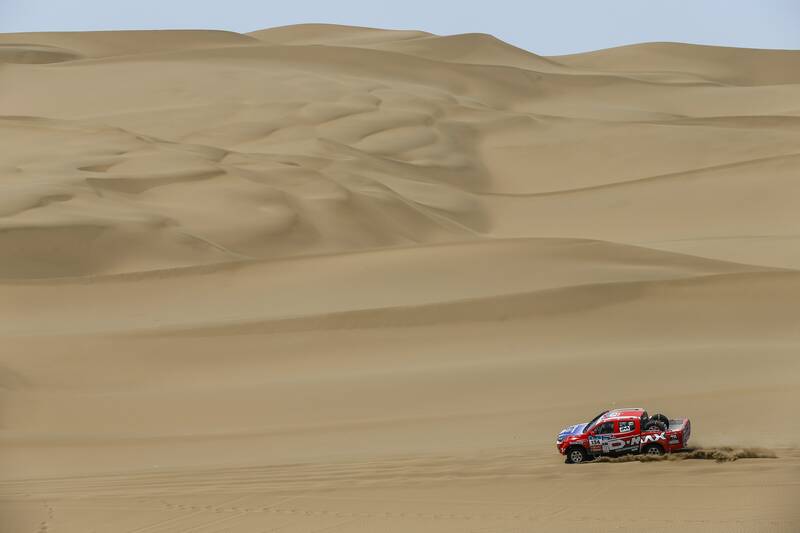 A desert storm in the Gansu region stopped the 330km competitive stage of the Silk Way Rally from proceeding yesterday due to safety concerns. The strong wind whipped up sand around the Dunhuang bivouac, preventing the event helicopters and relay planes from taking to the air due to low visibility. The ISUZU D-MAX (Car No.134) joined the remaining 99 competitive vehicles in convoy for the 525km journey from Dunhuang to Jiayuguan. Jiayuguan is situated close the Jiayu Pass, the largest and most intact pass of the Great Wall of China. Today the rally restarts, with a 666.92km liaison and a long tough 425km competitive stage, which will take the team from Jiyuguan and into Inner Mongolia where they will finish the day in Alashan. After competitors complete a fast blast along sandy tracks and conquer some tricky navigation, they will come face to face with the intimidating Gobi dunes. There are almost 400 lakes tucked in the hollows of the dunes. The Silk Way Rally now enters its final three legs. Competitors will cross the finish line in Hohhot on July 24, before driving to Beijing where they will celebrate the event’s conclusion with the awaiting crowd. 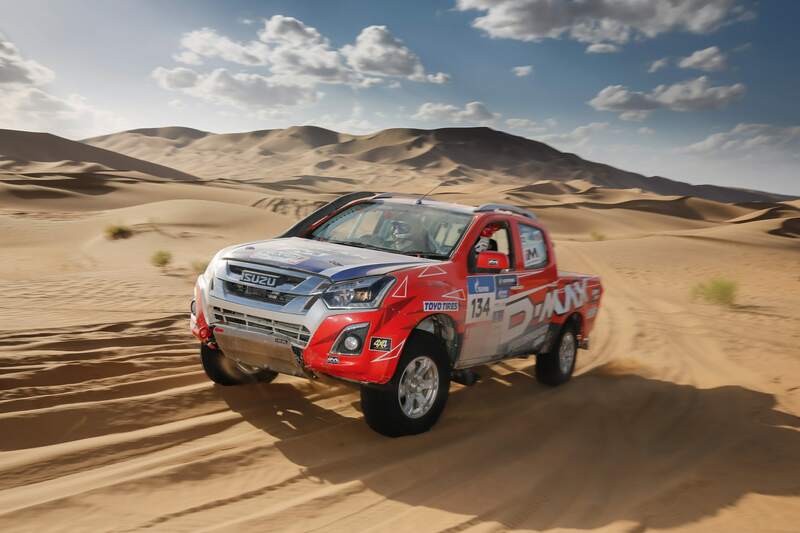 Adrian Di Lallo and Harry Suzuki on the ISUZU D-MAX(Car 134) continue to steadily climb the outright standings of the Silk Way Rally, finishing a tough Leg 12 in 27th position. 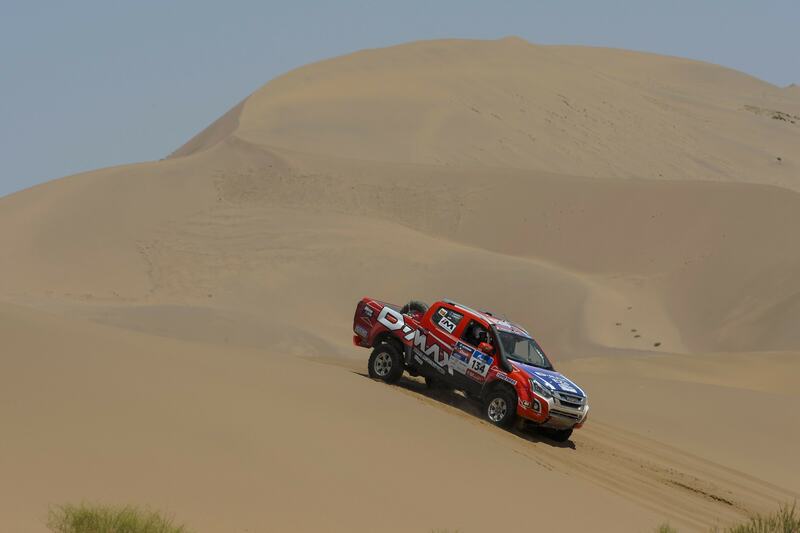 After the previous day’s leg was cancelled due to a sandstorm, it was back to business for the pair and their production-spec ISUZU DMAX, with a 241km liaison and a long 425km special stage featuring plenty of variety. Leg 12 took the team from Jiayungan to Alashan, the home of the notorious Gobi dunes. “Well someone ordered us a ‘cop the lot burger’ today!” said Di Lallo. “Today’s 425km special wasn’t exactly how it was described in the preamble! They called it the 400 lakes road – we think they should have called it the ‘road of 4 million gutters’. “The stage started on a high speed track, where we were quickly faced with lots of ruts, gutters and creek crossings. The mid-section was divided by a short controlled speed zone on tarmac and then some gnarly dunes followed by feshfesh tracks and then several massive dune field crossings. The stage rounded out with more feshfesh, high speed river bed runs and then the last track into ‘ruttsville’. The team still occupy fourth position in the T2 Production category, 5hrs 15mins behind the category leaders Akira Miura and co-driver Laurent Lichtleuchter. Everything was going smoothly in the dunes for Sebastien Loeb and Daniel Elena, until they were given a four hour penalty for failing to come within the required distance of way-points 75 and 76. This gave the stage win to outright leaders Cyril Despres and David Castera, with Loeb and Elena slipping down to tenth place overall. Yazeed Mohamed Al Rajhi and Timo Gottschalk now move into second outright. Leg 13 will become unlucky for those who do not pay careful attention to navigation. The 326km special stage will feature narrow tracks and tricky navigation between the dunes. Competitors will spend the night in Wuhai, which is located on the banks of the Yellow River, between the Gobi and Ordos deserts. It was another successful day in the dunes for the team, finishing the Silk Way Rally’s 367km penultimate special stage third fastest in the T2 Production category, only 33 minutes behind the category leaders. The landscape on Leg 13 looked like it had been pulled straight out of a Hollywood movie, with mountain-like bright yellow dunes which stood in between the DMAX and the Leg’s finish in Wuhai. “The landscape of the stage was something else! The immense dune field that we started in was a rich colour, powdery from its clay content. Down in the valleys of these monstrous dunes are many oases, complete with green grass, animals and a watering hole – just like in the cartoons! “There were also rock formations that looked other worldly as if a giant had dropped these weird looking rock piles randomly – and of course we encountered the local wildlife in the form of donkeys, camels and birds of prey. “We don’t often enough to stop and take check of just how lucky we are to see the things we see and go to places unimaginable unless you see it for yourself. With just one stage to go Di Lallo and co-driver Harry Suzuki are 5hrs 2mins behind the outright T2 category leaders Akira Miura and Laurent Lichtleuchter. To obtain a top three finish for the category, the duo would need to close a 40 minute gap on the next stage. Stephane Peterhansel and Jean-Paul Cottret once-again excelled on the desert terrain to be the fastest to complete the stage, with Russians Vladimir Vasilyev and Konstantin Zhiltsov only 3mins 27secs behind. Cyril Despres and David Castera finished the stage in third - further cementing their outright lead which now has a gap of 31mins 27secs. Today’s leg will give Silk Way Rally competitors a final 261km opportunity to elevate their standing on the leaderboard. The journey from Wuhai to Hohhot will feature fast sandy tracks and a few dunes. Organisers warn ‘the rally cannot be won on this ultimate timed sector, but it can certainly be lost’. After 15 days, three countries and over 10,000kms, the ISUZU D-MAX has crossed the Silk Way Rally finish line in 26th outright. 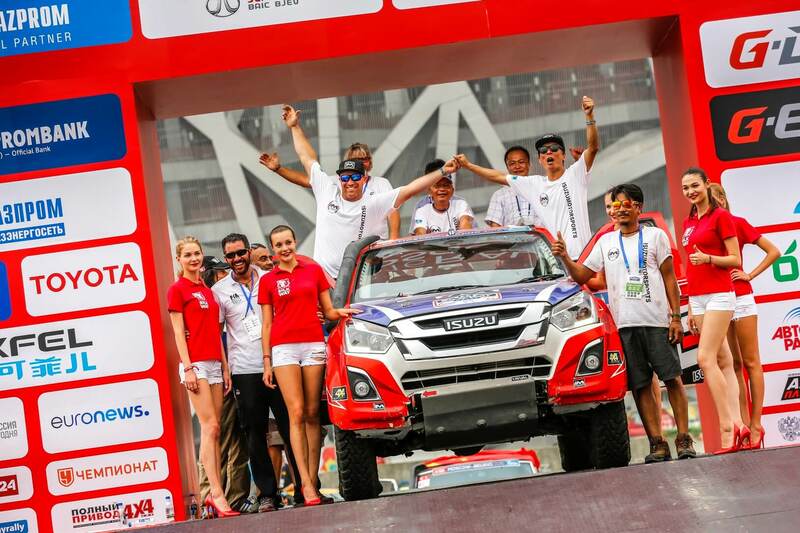 Over two weeks ago, 102 cars lined up at the rally’s start line in Moscow, and after the final leg only 72 cars crossed the final Leg’s finish line in Hohhot – with the ISUZU DMAX piloted by Adrian Di Lallo and co-driven by Harry Suzuki being one of this elite group. It was the first outing for the 2016 ISUZU DMAX which was competing in the T2 Production class – a category where only minor modifications predominately for safety purposes are allowed on the vehicles. In a category dominated by much larger capacity vehicles such as the Toyota Landcruiser, driver Adrian Di Lallo said the D-MAX was able to hold its own. “Over the past two weeks we have driven through some of the harshest conditions on the planet,” said Di Lallo. “There have been mountains, river crossings, patches of deep mud, desert plains, dune fields and more. “I can’t say that our production-spec DMAX has been the fastest car I have driven, nor was it the fastest T2 car competing at Silk Way – but it performed exceptionally well in highly esteemed company and has proven itself to be strong, robust and reliable. Better still, the fuel efficiency was so amazing that we only had to carry half the fuel load of some other competitors. The team came fourth in the T2 category, missing out on a podium finish by just over an hour. 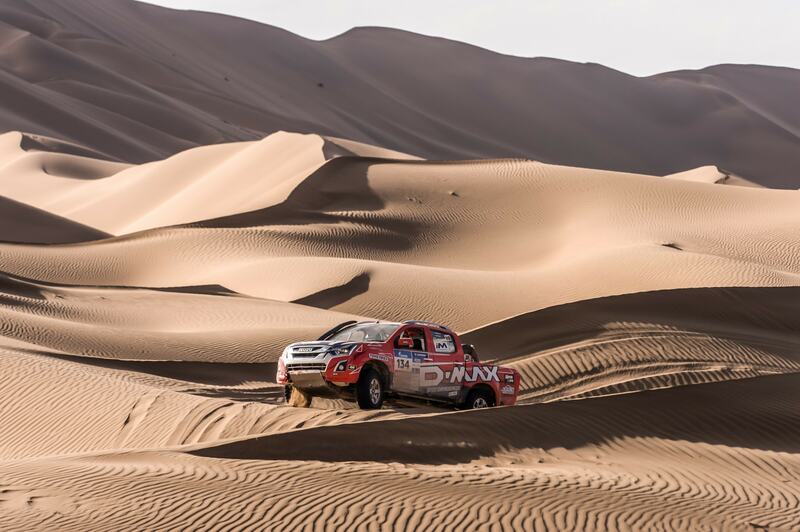 Akira Miura and Laurent Lichteuchter (Toyota VDJ200) had been leading the category for most of the event, but on the final leg lost their hour’s lead when they experienced problems in the dunes, giving the category win to Denis Berezovskiy and Ignat Falkov (Toyota Landcruiser). Miura and Lichteuchter had to settle for second and Kazakhs team Marat Abykayev and Andrei Chipenko took third place. Di Lallo said there was a large team that helped make their 10,000km journey a success. “So now that the final special stage of the Silk Way Rally is complete I would like to thank Harry and ISUZU Motors International Operations (Thailand) for their continued trust and support. “I would like to thank our crew: Rodger, Kano, San, AJ and Udom, for making sure our noble stead was race ready each day. The crew needs to travel as far as we do and then often work long into the night. “Thank you to the Silk Way Rally organisers for the care and attention that went into the event each day and for plotting such a magnificent course. The event was won by previous Moto maestros Cyril Despres and David Castera (Peugeot DKR 2008). It has been a mostly smooth run for the duo who have now claimed their first four-wheel rally raid win. Winning the final special stage, Yazeed Al Rahji and Timo Glottschalk (MINI ALL4 Racing) solidified their overall runner-up position 25mins and 51secs behind the winners. Russia’s Vladimir Vasilyev and Konstantin Zhiltsov (MINI ALL4 Racing) completed the podium with a final 49mins 46secs gap to the leaders. Competitors now make a 507km journey to the famous ‘Bird’s Nest’ stadium in Beijing on freeways which have been closed specifically for the event convoy. Once there winners will take to the podium in front of the crowd and all competitors will share in a final celebration of the event, before making the long journey back to their respective countries. 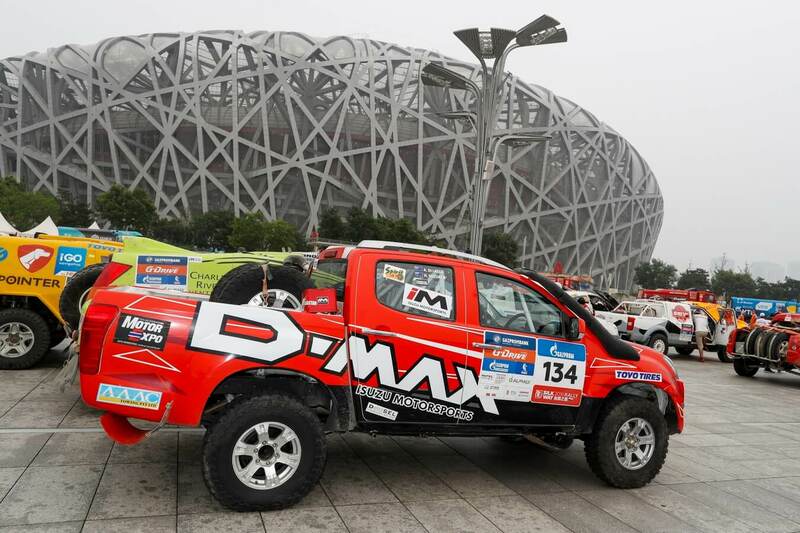 It was a feat just to finish the 10,000 kilometre Silk Way Rally, but the drivers Adrian Di Lallo and Harry Suzuki piloting a new untested 2016 D-MAX (Car 134) managed to complete the tough 15-day event as the highest placed pick-up truck in the ‘T2’ Production class. The ‘T2’ class was dominated by entries with a significantly larger engine capacity than the 3.0 litre turbo diesel D-MAX, such as the 4.6 litre V8 Landcruiser 200 series. The team were mindful of preservation with 8 of the 14 special stages over 300 kilometres in length. The 4,104.96 kilometre competitive course provided competitors with plenty of variety. Russia was host to Legs 1 and 2 which gave the challenge of dust, mud and rain. Legs 3 to 6 saw competitors faced with the treacherous tracks, hidden rocks, mud and mountains of Kazakhstan. Legs 7 to 15 were held in the desert terrain of China, with its searing hot temperatures testing the focus of competitors and huge dunes. Early on in the event it was obvious that it wasn’t only the gruelling desert terrain with its monstrous dunes and vast rutted steppes competitors needed to contend with, but also Mother Nature whoflexed her full force. Leg 2 in Ufa, Russia and Leg 11 in Jiayunguan, China were cancelled due to adverse weather conditions. The team lost time early on in the event due to a navigation error. They refocused after this incident, determined in their need to regain time, without putting the D-MAX at risk. Di Lallo fell in love with the stunning ever-changing landscapes they encountered throughout the event – and the variety of challenges those terrains presented themselves and the D-MAX. 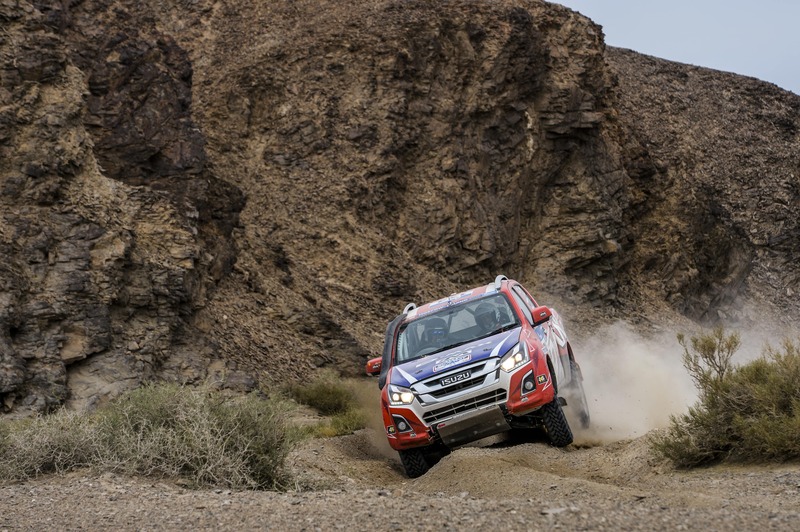 The Silk Way Rally Director Vladamir Chagin said “the rally is not won by the one who goes fast, but by the one who doesn’t break down.” Strategy combined with the durability of the D-MAX was credited for the team being one of the 71 autos that finished the event – out of 102 starters. The team placed 26th outright. The consistency of the ISUZU D-MAX throughout the special stages saw them place well in the ‘T2’ Class, finishing second on Leg 3 and Leg 6. They also finished in third place four times. These results equated to the team completing ‘T2’ Class in fourth place overall, six hours behind the class leaders, and finishing as the highest placed pickup in Class. Not everyone in the T2 category was able to reach the finish, with four vehicles having to retire along the way out of 17 starters. Di Lallo said he is proud of all the crew who all have come from different cultures to form a cohesive team. “We have this very ethnically diverse team, but it is certainly no barrier to getting things done! People’s Republic of China. The idea lies in “five connecting elements”: political coordination, a single infrastructure, trade relations, monetary and financial circulation, and humanitarian communication for the advancement in practical cooperation, promoting mutual political trust, economical integration and cultural tolerance with neighboring countries. The rally is organised by Vladimir Chagrin, a legend of the Dakar Rally, winning it seven times and holding an impressive record of 63 Dakar leg victories.The Russian Ministry of Sport, Chinese Ministry of External Affairs, Kazakhstan Ministry of Sport, FIA and the Automobile Federations of the host countries all took an active part in the organization of the event. The D-MAX was sporting ‘Morgan’s Forever’ stickers on the side of the D-MAX which travelled with the team on the 10,000 kilometre journey. These were to keep the memory alive and honour a young friend of the team who passed away suddenly.